There are four items in the vicinity of the Lamoille County Court House in Hyde Park. Two cannon on are either side of the walkway to the front door of the courthouse, and a list of names of the men who served on the front of the town Library across the street. 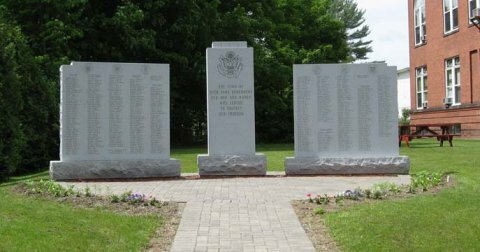 Just to the east of the courthouse is a modern monument commemorating veterans of the Civil War, Spanish-American War, World Wars I and II, Korea, and Vietnam. who served to protect our freedom. 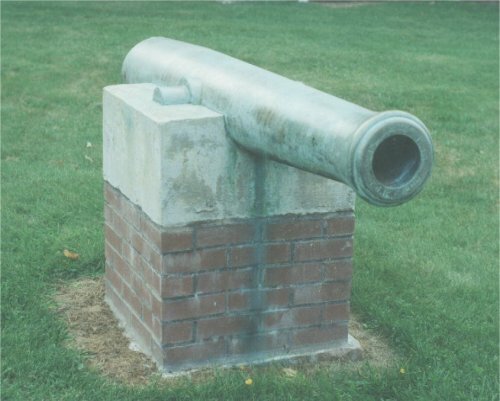 This one of two 1862 Napoleon cannon on the front lawn of the Lamoille County Court House in Hyde Park. The inscription on the muzzle of the cannon on the right side of the walkway is: "NO 45 REVERE COPPER CO. 1215 T.J.R. 1862." The inscription on the muzzle of the cannon on the left side of the walkway is: "NO 279 H.N.H & Co., 1238 lbs. T.J.R. 1862." Photographs contributed by Peter Flood.